Here is the 300 page autobiography of Ernest C. Wilson. Here is how you read it. If you are using a desktop computer or a laptop, then there are links to the right for each chapter. Click on one of them and the chapter will open. If you are using a small tablet or a smartphone, then the links are got by clicking on the "Click for menu" item just above this message. There are also arrows at the bottom of each page to from chapter to chapter. You should read it for two reasons. First, he was appointed head of Unity publishing in the late 1920s and later succeeded Charles Fillmore as minister of the Unity Society, a job he held until the late 1930s. This book is the best resource we have about the inner workings of Unity during that time frame. The raw, vivid nature of the stories in this book portray Unity's growth years in a way we can't really understand by historical analysis. His narratives about Unity and his characterizations of Charles and Myrtle, their sons, Frank Whitney, May Rowland, Imelda Shanklin and dozens of others are honest and penetrating. Second, in the late 1930s he moved from Kansas City to Los Angeles to launch his own Unity ministry. Over several decades he built one of Unity's most successful ministries, catering to the glamorous elite of Hollywood and early television. It's filled with glamour, name dropping and style. It's E! Hollywood and Unity at the dawn of the television era. He lived with the same imagination of the celebrities who came to his Wilshire Boulevard church. It's an easy read and it will connect your understanding of Unity to the lives of the Hollywood personalities you knew as a child. The mistake most people will make is assuming that an autobiography can't transform your life. But I am confident in saying that this book, along with Catherine Ponder's Dynamic Laws of Prosperity, are Unity's two most powerful texts we have in Unity on Prosperity. Read together, they will change your life. Dr. Ponder writes about the power of images and stories. Dr. Wilson shows their power through his life and ministry. But it's far more than glamour and glitz, images and stories. Anyone who reads Catherine Ponder's chapter on Charm will find it thoroughly illustrated in the life and work of Ernest Wilson. Charm is a long forgotten virtue. Ernest Wilson's metaphysical secret sauce was Charm. He was, I believe, Unity's Class Act. It was his charm that won the confidence of the Fillmores and it was also his charm that packed his Los Angeles church with brilliant, glamorous celebrities. If you want to know what Catherine Ponder means when she writes about charm, and if you want to know what it has to do with prosperity, then read this book. Another reason some people may pass over this book is because the stories are sometimes insensitive to our current understanding of race, gender and ethnicity. 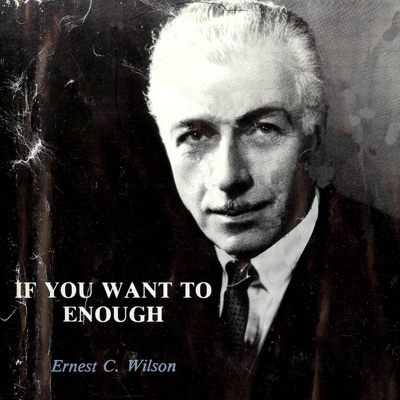 Ernest Wilson was a man of his time. But Unity's great strength is our ability to penetrate through human limitation to see the underlying Truth of one's being. I will only ask you to reserve judgment until you have got to Appendix 1. When you do, you will perceive the greatness of Ernest Wilson. Many of you know that I lost my Dad last week. Reading the Postscript and the Appendix broke my heart — wide open. I first read If You Want To Enough in 2010. A few years later I began searching for the copyright owner for permission to republish it on TruthUnity. Last year I finally connected with the niece and heir of the original publishers, Ronald and Beverly Potter. 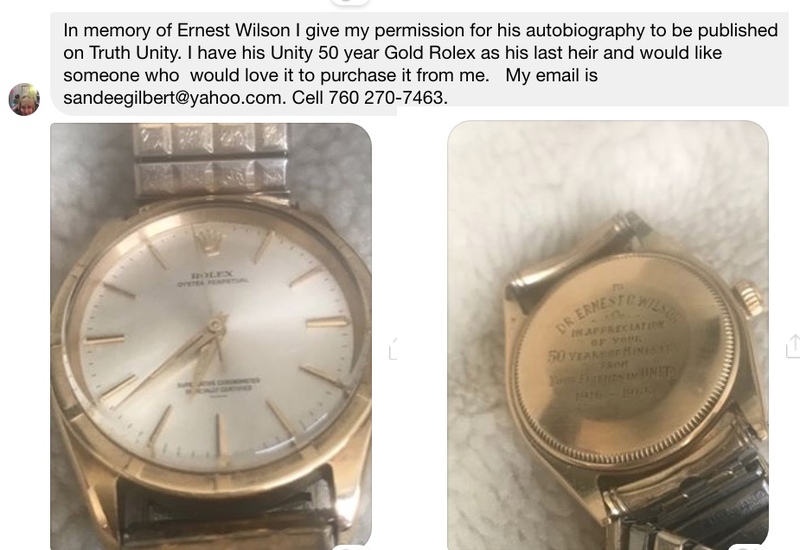 I found out that she has some keepsakes from Ernest Wilson, one of which is a gold, Rolex watch that had been given to Ernest Wilson on the occasion of his 50 years of ministry. She mentioned that she would like to see it belong to someone who will be inspired to have and wear it. If that person is you, then more information about the watch and how to contact her is shown below. Thank you, Sandee, for granting permission to share Ernest Wilson's inspiring story. Speaking for the thousands of people who will happen upon it here, know that we are grateful. If You Want To Enough, a book of memoirs, like the man who wrote them, is humorous, poignant, powerful, tender, full of insights. This book reveals the breadth and depth of the man: the stirring orator, the com- passionate pastor, the challenging writer, the loving friend, the effective teacher, the skilled counselor, the public figure, the private person. Ernest C. Wilson was born in Fargo, North Dakota, and ordained a minister in 1916. He was known internationally as a lecturer, writer, and a leader. His ministry began in San Diego, then Galveston, moving then to Minneapolis, and from there, to the Cleveland Unity Center until, in 1927 he became editor of Unity School’s YOUTH Magazine. He quickly moved up to editor-in-chief of all Unity publications while serving as senior minister for Unity Society from 1934 to 1938. In 1939 Ernest furthered the Unity work on the West Coast by founding Christ Church, Unity in Los Angeles. He returned to Kansas City once again in 1965 and served the Plaza Church until his retirement in 1976. During his tenure of service to Unity he wrote seventeen books, compiled many poems and articles, introducing the Master Class Lessons in 1932. He originated Unity’s Christmas Candlelighting and Easter Flower services. Even with all this, he spoke daily on radio and became a celebrated television pioneer.